When I saw the topics for Inspire Me Thursday (the peace sign) and Illustration Friday (save), the first thing that came to mind was an illustration and post about how peace can save the world. And it’s true… until we can find peace – within ourselves, our societies, and among nations – we will live in a constant state of strife and destruction. But as I started thinking about what I would write, all that came forth was that peace must originate from the individual. There are innumerable things each person can do to promote peace, starting from within… for a person who has inner peace will not make war with another. 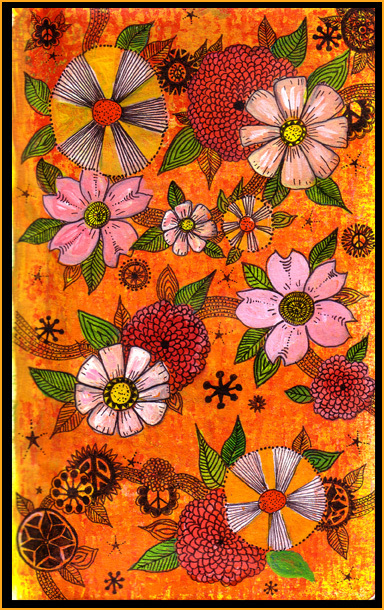 This journal page is inspired by peace signs and flower power… and my true desire to wish all of you peace, love, and happiness! _______________________________________________________________________P.S. – Please accept my invitation to stop by Wings 4 You Coaching and participate in my Weekly Wings challenges. There’s a new challenge posted each Sunday. I’d love to have you along on the journey!